Thought those black things on the seabed weren't edible? Think again. Sadly I tried and failed at this one. 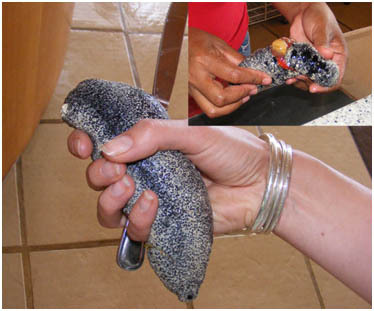 In the Cook Islands you can eat sea cucumber, which are those weird black things which loll around on the sea floor. You simply pick them up from the bottom of the ocean, slice them open and pull out their soft yellow spaghetti like guts and munch away. Easy. Unfortunately, no-one told me quite how far out you needed to go to get hold of the ‘right’ sea cucumbers. On this particular mission me and fellow food explorer Katy Warburton set out to grab hold of one of what seemed to be many black soft sea cucumbers which lay all over the place. They’re strange things because the minute you pick them up they go kind of limp and mould themselves to the shape of your fingers. Then they squirt a jet of water at you with alarming accuracy. Having negotiated these perils we took our sea cucumber to a local lady who duly sliced it open with a big carving knife. There was blood and icky orange messy guts. “This is not the right on” she tells us, wrinkling her nose in disgust. “It is too small.” And so we take back our butchered friend to drop back in the sea and trek out further to find bigger prey. It should be noted here that sea cucumbers honestly do recover from this treatment – really they do. You can slice them and gut them and drop them back and they heal up all ready to grow some new tasty guts. Unless you get the wrong one and then they just heal up wondering why you picked on them in the first place. At around this point Katy got bitten by a trigger fish (karma), and we realised we weren’t going to be able to get far out enough without a boat. I’m all up for having another try, but on this occasion didn’t manage to get the sea creatures to spill their guts.